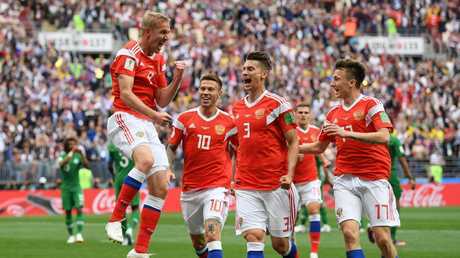 RUSSIA has got its World Cup campaign off to a stunning start, storming to a 5-0 win over perennial Cup easy beats Saudi Arabia. It goes down as the biggest World Cup opening day win since 1934. The Falcons haven't won a game at the tournament since 1994, and that streak was extended at the Luzhniki Stadium in Moscow as they were comprehensively outplayed by a Russian side buoyed by a bumper home crowd. Two goals to substitute Denis Cheryshev, including an incredible outside-of-the-boot stunner, and an outstanding performance from young star Aleksandr Golovin headlined the victory. After Robbie Williams rocked the crowd in a well-received opening ceremony, Stanislav Cherchesov's men did the entertaining with a dominant on-field performance. 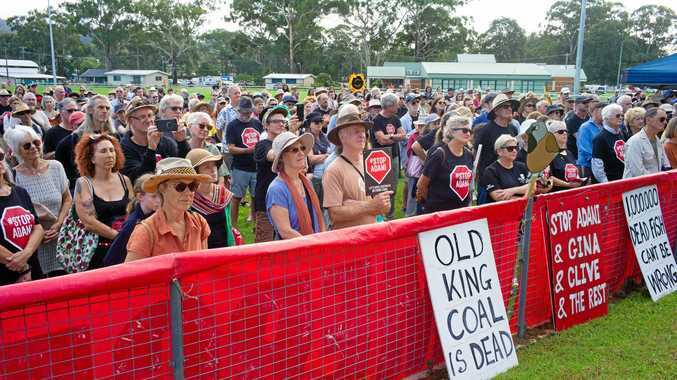 It took them just 12 minutes to break the deadlock and get the crowd on their feet. Surprisingly it was Yury Gazinsky who found the net - picking the perfect time to net his first international goal - rising highest at the back post following an outstanding cross from young gun Golovin. The 22-year-old has been touted as a potential breakout star of this tournament, and his classy ball for the opener showed precisely why. It was to be the first of two outstanding assists, which preceded an outstanding free kick goal, as the CSKA Moscow star announced himself on the biggest stage. 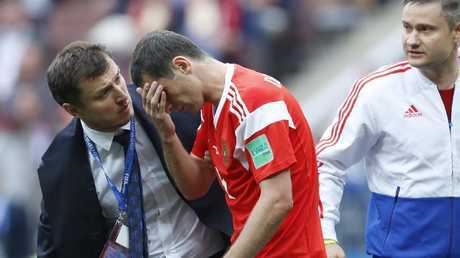 But the home side's elation quickly turned to despair when they lost star Alan Dzagoev after just 24 minutes to a what looked like a serious hamstring injury. The midfielder left the park devastated after pulling up clutching his left leg. A tearful Dzagoev made way for Denis Cheryshev, and it didn't take long for the substitute to make his mark on proceedings - finding the net and making history in the process. The winger, who is on the books at Real Madrid, popped up to double the lead just before the break, becoming the first man in history to net in a World Cup opener after coming off the bench. Cheryshev made the most of his opportunity by keeping his cool to incisively skip over a challenge inside the box, before rifling a powerful effort into the top corner. As he wheeled off in celebration, it was pretty clear the sorry Saudis were in big trouble. 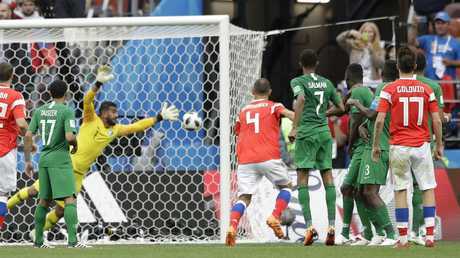 The men in green never really settled into the match, turning over the ball time and time again as they allowed the Russians to take charge of the match and throw their weight forward. It didn't get much better for Juan Antonio Pizzi's side in the second half. 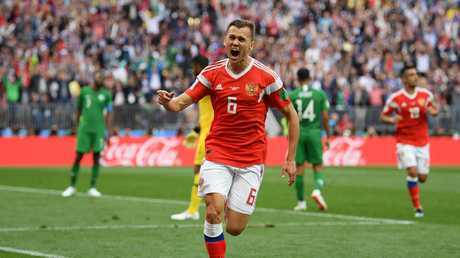 Both coaches switched up their personnel as the minutes ticked by, and in the 70th minute Cherchesov turned to hulking striker Artem Dzyuba as Fedor Smolov made his exit. Similarly to Cheryshev, the big man made his presence felt almost immediately. Denis Cheryshev of Russia celebrates after scoring his team's second goal. Just a minute after Dzyuba entered the fray, another pinpoint cross from Golovin found him at the back post and he made no mistake - heading expertly into the net to extend the lead to an insurmountable three. The job was done, with the hosts to nab three points at football's showpiece for the first time since 2002. But they didn't stop there, refusing to take their foot off the gas as they heaped even more pain on the sorry visitors. Cheryshev turned it on once again with just a few minutes left on the clock, netting an audacious outside-of-the-boot strike. It was reminiscent of Andrew Nabbout's effort that was awarded A-League goal of the season, as the wide man struck powerfully to register his second of the match. It looked to have been the cherry on top of an enormous win, but Golovin netted a superb effort of his own with just seconds left. The youngster stepped up to a free kick outside the box, then curled a powerful shot home to cap a stunning 5-0 result. Two assists and a goal for rising star Golovin - an undoubted one to watch as this tournament progresses - and the perfect start to a World Cup on home soil.